« Militant Angeleno Starts Second Year Of Militancy With New Vlog Feature! 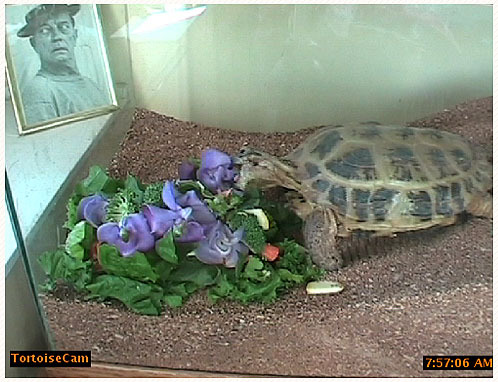 Yesterday, Buster our tortoise took most of the morning to find the snack of snail vine blossoms I left for her (which she then devoured within minutes). This morning within minutes of installing her foodstuffs (with another generous helping of snail blossoms), she was aaaaalllll over it, allowing the TortoiseCam to capture what I consider to be the very definition — the quintescensce, if you will — of reptilian nom nom. P.S. Yes, a picture of Buster’s famed and much beloved namesake* was added just because I could. *And don’t start about me naming a female Buster. When I first began caring for the fugitive tortoise back in 2001 I thought she was a he — and either way the stoic resemblance is there. This entry was posted on Tuesday, June 17th, 2008 at 8:09 am and is filed under animals, food. You can follow any responses to this entry through the RSS 2.0 feed. Both comments and pings are currently closed.